This Conference comes at a time of significant change for providers, employers and of course, the wider-Welsh economy. In addition to the changes in the macro-environment, there are also changes taking place at a sectoral level too, not least of all the changing nature of provision, the increasing need to professionalise the workforce, and of course the systems and structures that underpin the work of the sector. With this back-drop of change in mind, this conference focuses on what can be done to improve the apprenticeships and skills provision in Wales, both now and in the future, in order that the sector meets the needs of future generations. 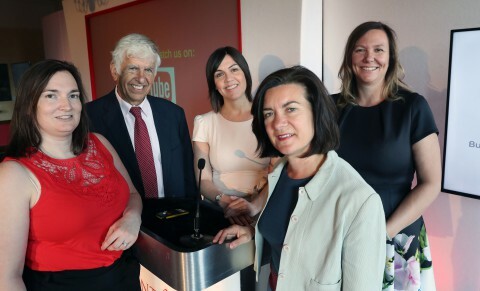 NTfW Conference 2018 – Left-Right: Sarah Harris, Assistant Director (Vocational Qualifications), WJEC; Dr John Graystone, Executive Chair of the Board, Agored Cymru; Andrea Melvin, Head of Learner Provision, Skills, Higher Education and Lifelong Learning, Welsh Government; Eluned Morgan AM, Minister for Welsh Language and Lifelong Learning and Sarah John, Chair, NTfW.